Tired of tepid TV? Joss Whedon's Firefly is the story of a man holding fast to his principles, sticking to his unusual and groundbreaking vision, and winning. A firefly is a creature given to metaphor. Short-lived, dazzling, and surprisingly bright, it conveniently mirrors larger occurrences in history and allows us to essentialize and encapsulate them in one convenient image. When Joss Whedon gave his FOX show the moniker Firefly, I don’t think he did so with the foresight that it would so closely mirror the actual lifespan of the little bug. I’d like to think, rather, that he knew (given the right creative freedom) he could make the show sparkle and delight like its namesake. Happily, he was right, and I was utterly delighted. Firefly is a series centered around nine very unique characters living, working, and traveling on a “Firefly-class” spaceship set some 400 years in the future. True, the future is apocalyptically grim — a totalitarian state exists in the form of the far-reaching Alliance, reminiscent of Darth Vader's troops in demeanor and attire. Our heroes, however, manage to eke out an exciting if meager existence on the cusp of illegality by running a smuggling operation in their cleverly designed vessel. Always railing against the stifling control of the state, they fly from planet to planet encountering various scenarios, forging close bonds among one another and slowly unveiling the mysteries behind their characters for the benefit of the audience. Firefly is a science-fiction show dressed as a western and written as a drama with some of the sharpest, cleverest riposte on TV. Written and directed by Joss Whedon of Buffy The Vampire Slayer, Angel, and Toy Story fame, it is easily the best work he has done to date, and the work which least resembles the current staid fare the networks present. It wasn’t until I saw the show extras on my DVD set that I came to a more complete understanding of why this series was so good. The narrated sections took me through the concept, set design, camera/FX/CG work, and musical score — I saw how each element was controlled by people with a deep understanding for their craft and a genuine love for the show. The series was run in a “fly by the seat of your pants” experimentation mode, and in watching the narrative I heard the phrase “You simply don’t do that” many times. As someone fascinated by business process, I love to hear that kind of thing — it’s usually the way innovations and breakthroughs happen. To me, Firefly is primarily an example of what happens when a talented group of people come together and give their best to a project which is itself led by someone talented giving his best. In the same way as like attracts like on a personal level (you can tell a man by the company he keeps, as the old saying goes), like hires and retains like on a professional level (you can tell a company by the people it keeps). I think this dynamic explains why companies carefully and obsessively controlled by the original entrepreneur or by a strong CEO have such a different feel from those controlled by the “everyone and no-one” of committees in bureaucratic organizations. Personally, I don’t buy into the idea that things should be run by committee. Projects that shine are always, ultimately, controlled by an individual. One person holds a vision and controls the execution at the macro level — he hires people who “get it” and they control its execution at the micro level. If you look at the credits of Firefly you will see that Joss Whedon even wrote the theme song — there’s no mistaking who was at the wheel. Digging a little deeper into the drama behind the drama, I learned that Whedon had innumerable problems with his host network, FOX. Seemingly wishing to do everything possible to make Firefly a ratings failure, FOX screened the series out of order (the carefully orchestrated pilot was deemed to be a little too slow as a starter), moved the screening slot constantly, and finally canceled the show. It seemed FOX was expecting something else from Joss Whedon — perhaps something of the ilk that is expected to resonate with current TV viewers. Whedon gave them something so unrecognizably good that it wasn’t valued until very recently. Someone who didn’t understand the concept of Firefly and who wasn’t completely and irrevocably committed wouldn’t have fought so valiantly for its original inception. We wouldn’t have had the short, fresh, violent, and utterly brilliant season of Firefly we do today — we would have had a season of Friends on a spaceship. Whedon fought for his concept, and today we have a piece of art that is incredible in its design and execution. Whedon’s commitment to his passion is one of the things worth celebrating in the Firefly phenomenon — it is the story of a man holding fast to his principles, sticking to his unusual and groundbreaking vision, and winning. The echoes of Howard Roark’s struggle, in The Fountainhead, to maintain his artistic vision and integrity immediately leap to mind. There is also joy in learning that Firefly’s following is disproportionately strong for a show technically classified as a “flop.” Firefly forums abound on the internet, and loyal fans flock to conventions to hear the actors and director speak. The groundswell is so strong, in fact, that Universal Studios has purchased the rights to produce a Firefly movie, Serenity, which is scheduled for release on April 22, 2005. What is it, then, that makes this series so endearing to its fans? Why the tributes? Why the passionate struggle to keep it on the screen? Why the knowing smile and instant camaraderie when someone introduces himself at a party as a Firefly fan? For me, what the show gets so right — what sets it apart from every other show I’ve seen — is the fact that the morality is so damn close to what I agree with. The characters don’t faff about — they know which action will give them the most benefit personally and pursue it without qualms. There is no apology for what would usually be considered crude opportunism. For someone who enjoys Ayn Rand’s work, Firefly is a welcome respite from the myriad of flawed, moribund, and lackluster moralities of the shows routinely presented on the small screen. The story itself is engaging, and doesn’t allow the futuristic backdrop to rob it of a plausible storyline. It is not a prerequisite to have enjoyed Sci-Fi previously — this isn’t traditional Sci-Fi. The characters are well rounded and complex, and the storylines are masterfully and surprisingly interwoven. Whedon spins his verbal mastery to give the characters strong, punchy, funny lines that you will find yourself quoting often. So here’s an endorsement — nay, a directive. When there’s so much entertainment around and so much of it is lukewarm, finding something that makes you think, laugh, gasp, worry, admire the actors — and chew the couch cushions — is a prize. Discover the joy of Firefly for yourself. 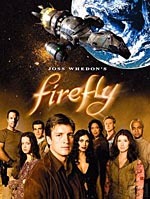 The complete Firefly TV series, including several un-aired episodes, is available for purchase from Amazon.com. Likewise for the movie Serenity. Monica White is an Australian living the life of an entrepreneur in London. A newly avid blogger, she loves to use her cyberjournal, Th'inkwell, as a forum to explore interesting ideas, passionately celebrate all that is enjoyable in life, and occasionally give people a well-deserved bat over the nose. The show was recommended to me by another libertarian, who is not an Objectivist. His review stressed the anti-authoritarian frontier theme. I think that he missed the true value. I agree that the characters act on the basis of their values. While they each know their self-interest, for each that is different, based on their personal life experiences. Thus, the show is about morality: beliefs becoming actions. Those different standards bring tensions. On board is Inara Serra, a "Companion" (prostitute) who has her own detachable shuttle. She and captain Malcolm Reynolds have a passion for each other that neither will admit. In one episode, Reynolds strikes a man and enters a duel. That resolved, back on the ship, she says something like, "You strike a man for calling me a whore, then you call me a whore to my face?" And he replies, "I don't value your profession. He did not value you as a person." The advantage to the DVDs include the narratives and backgrounds that Monica White found so illuminating. Also, you can review the parts that go by quickly. And you can pick your languages for speech and subtitles. You might need that because a lot of the cursing is in Chinese. In this 26th century future, America and China have merged. They dominate Earth and Earth dominates the Alliance of its colonies. Joss Whedon said that you get the look and feel in the first scene where a character eats from a traditional cowboy camp mug with chopsticks. You can find a detailed summary of characters and plots on Wikipedia, of course. Loved the show, and (a belated) thanks for pointing out the positive ethics represented in it. I think that's part of what made me fall in love with it in the first place, when I was first exploring my own sense of morality and finding the mainstream offerings wanting. Sounds like what CBS did to Jericho, another thought-provoking series with a more slowly developing story line than the mindless action and autopsy shows TV is cluttered with these days. Jericho didn't fail, it still has a loyal fan base that would like to see it return. CBS did everything it could to sabotage its own show.